Off-payroll working: new rules for the public sector | News | Baxter & Co. The government confirmed in the Budget on 8 March 2017 that the new rules for ‘off payroll working’ in the public sector will apply from 6 April 2017. The new rules apply to all public sector bodies which includes academy trusts. In brief, as from 6 April 2017 trusts will need to determine whether the new rules apply when engaging a worker through an intermediary directly or via an agency. If the new rules do apply, then either the trust (if you make payment direct to the final intermediary) or the agency, will need to deduct tax and national insurance (employee’s and employer’s) from the payment. The new rules apply to all payments, made on or after 6 April 2017, so existing arrangements will need to be reviewed. If the new rules do apply to existing arrangements, consideration will need to be given, to the cost of the secondary (employer’s) national insurance. This may involve a renegotiation of some contracts. The new rules referred to as ‘off-payroll working in the public sector’, are part of the government’s drive to ensure that where an individual provides services to an organisation in the same kind of circumstances that an employee provides services, that individual is subject to the same taxes and national insurance as an employee. The new rules make the trust responsible for determining whether an individual, providing services through an intermediary should be treated as an employee, for the purpose of tax and national insurance. An intermediary is a ‘person’, who stands between the Academy and the individual, that is providing the services. Usually the intermediary will be a company but it can also be a partnership. The intermediary can be in or outside the UK. There can be a number of intermediaries between the trust and the individual or just one. Where a trust engages directly with an individual, for example, engaging a peripatetic music teacher, the new rules do not apply. In those cases, you will still need to make a determination as to the individual’s employment status, as is the case now. You should use the new Employment Status Service online tool to establish how HMRC are likely to view the arrangement (see below). Where a trust engages with an agency and the agency employs the individual (e.g. a supply teacher who is an employee of a supply agency), the position remains unchanged – the agency is responsible for applying tax and national insurance to payments it makes to the individual. The services are provided under circumstances where, if the contract had been directly with the trust, the worker would be regarded for income tax purposes as an employee of the trust (or the holder of an office with the trust, or the worker actually is an office holder with the trust). Where the rules apply, the person directly paying the fee to the intermediary for the worker’s services ‘the fee payer’, is treated as the employer for tax, NICs and Employment Allowance purposes. An academy trust will be treated as the fee payer where it is directly contracting and paying the final intermediary, ie the intermediary which most directly engages the worker. But note as above, this excludes the situation where an agency is employing a supply teacher, applying tax and NI to payments it makes to them. It is the responsibility of the academy trust to determine if the new rules apply in respect of any engagement. You must look at the arrangements under which the worker provides their services. If applying the ‘employment status tests’ to that engagement shows they would have been an employee of the trust but for the existence of the intermediary, then the engagement is within the new rules. This is the same kind of employment status tests based on case law that trusts and agencies have to consider when they hire individuals directly. If you pay the worker’s intermediary, you are the ‘fee payer’. You must deduct PAYE/NIC from the payment and are liable for employer’s NICs and Apprenticeship Levy payments (if your pay bill exceeds £3m). 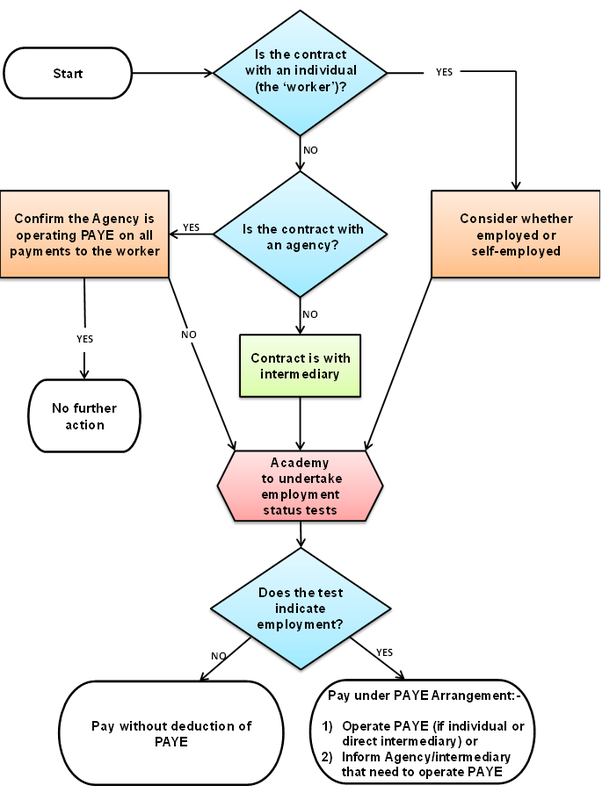 If there is another intermediary in the contract chain between the trust and the intermediary which directly provides the worker, then this organisation is the ‘fee payer’ (as it is closest to the worker’s intermediary) and it must fulfil the tax and NIC withholding requirements. Where there are a number of organisations in the contract chain, the ‘fee payer’ will always be the organisation that contracts directly with the worker’s intermediary (unless it is a non-resident body). The worker is legally required to furnish NINO, tax code and identity details. Where the worker is unable to provide a form P45, code OT or BR must be applied. You (via your payroll bureau, if applicable) will need to complete the normal RTI process and notify HMRC of the amount of the taxable earnings and the tax, NICs and Employment Allowance through the RTI process. However, statutory payments and other employment rights are unaffected by the new rules. The trust has no obligations to the worker for sick pay or maternity/paternity or redundancy pay. There is no right to auto-enrolment,any pension provision or for paid annual leave. You are required to inform the intermediary, agency, or third party that the contract falls within the new off-payroll rules or that it does not. This conclusion can be included in the contract document itself or separately. It is then the fee payer which is responsible for operating PAYE/NI. An intermediary, agency, or other third party can request that the trust provides this determination if it is not provided. You must reply to such written requests for a decision, within 31 days of receiving the request. If you do not reply to such a request within that time limit, the academy trust becomes responsible for accounting for PAYE, even if it is not the fee payer. You must also provide to an intermediary, agency, or other third party the reasons why you reached the conclusion you did, if so requested. Academy trusts must ensure there is clear process in place to comply with this information requirement. What are the Employment Status Tests that you need to apply? You must look at the arrangements under which the worker provides their services and decide, by applying the employment status tests, as to whether the engagement is one where the worker would have been an employee of the Academy but for the existence of the intermediary. The employment status tests derive from the body of case law and comprise a number of factors to be considered. The attached appendix summarises the key tests. This tool is useful but is not conclusive in itself. It will however give you an indication of what HMRC’s view is likely to be. In many cases the new rules will not affect an academy trust because either individuals are contracted directly or individuals are provided through an agency and the agency is operating PAYE under the existing agency rules. There may though be situations where a trust contracts directly with an individual’s personal service company to provide that individual’s services to the trust. In such situations, you will need to assess whether the new rules apply. If directly with an individual, then this is a good time to consider whether the nature of the relationship is one of employment or self-employment, using the new online tool, which is different from that you will have used in the past. If employment, then the individual should be on the payroll as an employee, with all the usual statutory employment rights. Trusts should already be doing this so there shouldn’t be any major change. If with an agency, confirm with the agency whether they are operating PAYE on payments to the individual. If not, then follow the procedure below. If with an intermediary who is not an agency, or where the agency is not operating PAYE, apply the employment status tests to determine whether this is a deemed employment. If the contract is direct with the intermediary which employs the individual, operate PAYE on making any payment. Ensure all of the above is documented. Note: These requirements apply to any payment made after 6 April 2017.All existing arrangements will need to be reviewed. Is the person in business on their own account? If an individual is running their own business, eg. he/she has business premises (which can be part of his/her home) and equipment, they market their business and have a number of different clients, he/she is likely to pass this test. This test can be conclusive in itself of self-employment, but if the individual does not have all the trappings of a business, he/she can still be self-employed. We will assume a male gender in applying the remaining tests. The level and type of control exercised by the engager (the academy trust) is a key factor in deciding whether a person is employed or self-employed. Is he subject to the control of his engager ‘in a sufficient degree to make that other master’? That is control as to how he performs his work, where he performs his work and when he performs that work, as well as the degree to which he is under the direction and supervision of the engager. The more freedom a person has as to where and when he carries out his work, and how he does it, the more likely he is to be regarded as self-employed. Often the nature of the work is such that the individual may have little control as to the when and where he performs the work. So this test is often not conclusive in itself. If a person has his own employees or sub-contractors, he is very likely to be in business on his own account. Is there a right of substitution? Personal service is fundamental to the employment relationship. So if an individual can send a substitute, he is not an employee. However, this has to be a real possibility. It is usually not sufficient just to include such a clause in the contract. Does he supply his own equipment? If an individual provides significant equipment which is essential to carry out the task, he is probably self-employed. The provision of only small tools or a laptop is unlikely to determine the question one way or the other. Does the person have the opportunity to profit? Does he take financial risk? A fixed fee basis provides the opportunity for profit if the work is carried out quickly or a loss if it takes longer than expected. Other indicators include offering credit terms, taking on financial commitments related to the work, providing guarantees as to the work, making good losses and requiring working capital. These will all involve a degree of financial risk and so indicate self-employment. The ability to negotiate the terms can also be an important indicator. Is there a mutuality of obligation? Mutuality of obligation means that the individual agrees to carry out the work and the engager agrees to pay for that work. It is not always a useful test as mutual obligations are common to both employment and self-employment contracts. However, its absence may support self-employment. Is the person a ‘part and parcel’ of the engaging organisation? This test looks at to what extent the individual is integrated into the organisation and would be perceived by a third party to be a part, or a representative, of that organisation. This includes having a business card showing the organisation’s details, have a permanent desk/telephone/secretary, having managerial responsibilities and attending employee events. If all the other indicators are evenly balanced, what the parties intend the person’s status to be, may settle the matter. Rebecca works through her own Personal Service Company (“PSC”), Fund It Ltd and is interested in a six month engagement as a fundraiser for the Academy. Fund It Ltd has a draft contract from the Academy to provide Rebecca’s services. The Finance Manager uses the online Employment Status Service to determine if Rebecca’s role should be subject to them or not. The Employment Status Service asks for responses to a variety of questions to determine whether off-payroll working rules should apply. For Rebecca, the tool indicates that the rules should be applied. The contract will be subject to the new rules for working off-payroll in the public sector. Rebecca provides the Finance Manager at the Academy with the information needed to set her up for PAYE, as if Rebecca was an employee. This includes her NI Number, date of birth and personal address, a P45 from Rebecca’s previous employments in the tax year if available and her bank account details in to which payments will be made. Rebecca does not need to provide any Student Loan information as she declares that through her self-assessment tax return. The Academy’s finance team informs the payroll provider about Rebecca. The payroll provider sets Rebecca up on their systems to enable PAYE and NICs to be deducted from payments to Fund It Ltd. Rebecca will not be enrolled in to the Academy’s pension scheme, or pay-rolled benefits arrangements. The Academy will pay secondary (employer’s) NICs related to the engagement, as it does for directly employed people. Each month, Fund It Ltd invoices the Academy £7,200, which includes £1,200 VAT. The Academy treats £6,000 as Rebecca’s earnings and (via payroll) deducts £1,400 tax and £400 employee’s NICs which it pays to HMRC via RTI with £700 employer’s NICs. Each month, the Academy pays Fund It Ltd a total of £5,400, which is £4,200 for the services provided plus £1,200 VAT. Rebecca is being treated for tax/NI purposes as a deemed employee. She is not, as a matter of law and fact an employee of the Academy so she will not be able to claim statutory payments, such as Statutory Sick Pay and Statutory Maternity Pay. Rebecca will continue to claim any such statutory payments through Fund It Ltd.
Rebecca draws £3,000 in salary each month through Fund It Ltd’s payroll. Tax and NICs are not deducted as these have already been deducted at source by the Academy. This means that Rebecca will continue to be able to claim statutory payments, as she can now. When the contract comes to an end, the Academy gives Rebecca a P45 as they would for a directly employed person who leaves their employment. The P45 indicates Rebecca has paid £8,400 tax and £2,400 NICs. Teachers 4 U Ltd supplies teachers to Anytown Academy through an umbrella company – off-payroll working rules do not apply. An employment agency, Teachers 4 U Ltd specialises in supplying teachers to local schools. The Academy has asked the agency to provide a supply teacher for a full school term to cover an unexpected absence. The contact is worth £15,000 plus VAT. Hamed is a supply teacher who provides his services through a PSC, Hamed Tutoring Ltd. He gets much of his work through Teachers 4 U Ltd. He is paid for his work, found through the agency by an umbrella company, Teeming Ltd who deduct tax and NICs from his salary. Do the off-payroll rules apply? Teachers 4 U Ltd has the contract to find teachers for the Academy. The umbrella company, Teeming Ltd is the organisation that the Academy pays for the workers’ services. Hamed is providing his services to the client, the Academy. He is however contracted through Teachers 4 U Ltd to Teeming Ltd, with whom he has a contract of employment. Teeming Ltd pay the teachers through their payroll, deducting tax and NICs. The Academy determines that, as Hamed has been supplied by Teachers 4 U Ltd and has a contract of employment with Teeming Ltd under which he is paid subject to PAYE, the off-payroll working rules do not apply. Teeming Ltd, the body that pays Hamed, is responsible for paying secondary NI contributions related to his contract to work at the school. Janice is a Project Manager, contracted by a building company to work on the construction of the new sports hall at Anytown Academy – off-payroll working rules do not apply. Janice is a project manager who provides her services through her own company, Janice PPM Ltd. The company has been contracted by Halls Construction Ltd to project manage the building of the new sports hall at Anytown Academy. Halls Construction Ltd is being paid an amount of £5m for the construction project. Halls Construction Ltd is expected to pay their own staff and contractor costs for the project. Janice’s role will be to work closely with the Academy to understand and deliver the project requirements and with the construction company and other partners to make that happen. She meets with the Academy staff as part of the recruitment process, but the recruitment decision is for Halls Construction Ltd. The Academy, whilst having an interest in the work of Janice, is not responsible for paying Janice’s PSC. They will not be responsible for determining whether or not off-payroll rules should be applied. Payments will be made to Janice PPM Ltd gross plus VAT by Halls Construction Ltd.